Welcome to lavender bliss. 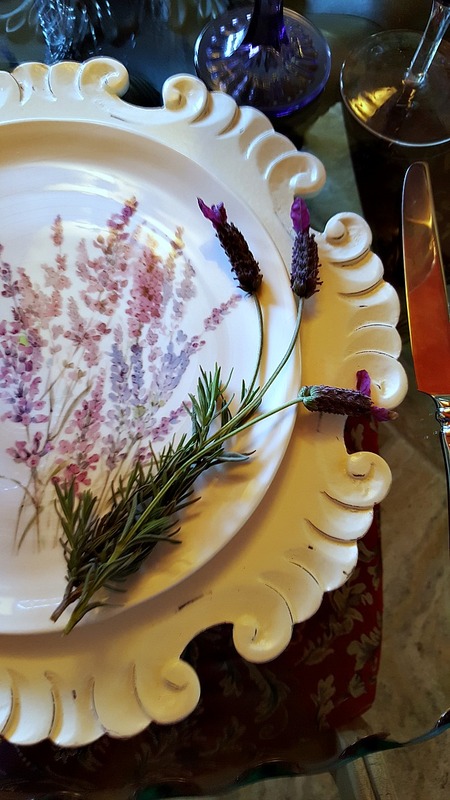 With all of the lavender we have in our yard, it makes perfect sense to display a pretty table with these beautiful flowers. It makes for a lovely display in a pretty vase. Lots of Lavender on this table fresh from our garden. A simple arrangement I put together . I made these Blueberry Lavender scones. This is the very first time I made scones. I really like them when they are warm. 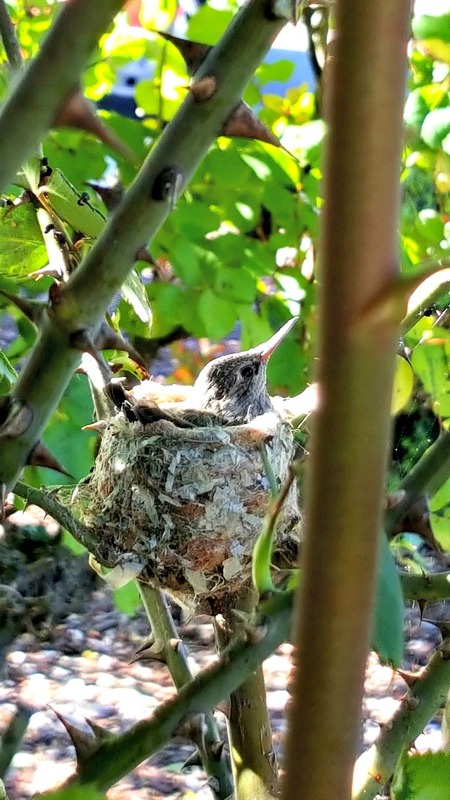 An updated picture of the baby hummingbird. I guess the other egg did not hatch. They usually have two eggs. The baby is becoming more alert now. This nest is at my parent's house, close to their front door. I really don't understand this choice of location, since the rose bush is not full. I was concerned about the rains, so I put an umbrella over the rose bush. 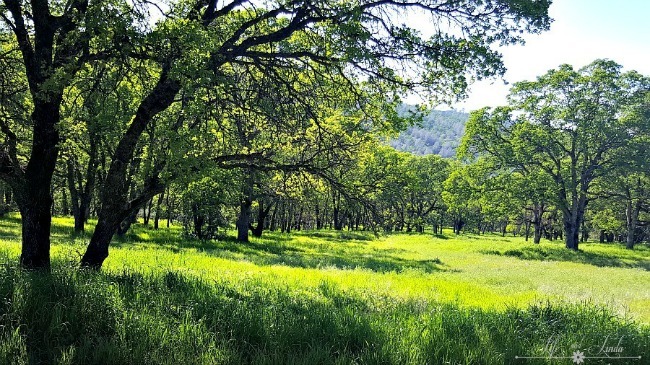 Our property is so green right now after all of the rain. Love this time of year. Such a pretty table - I loved a lavender plant however I am not fond of the scent! I would love sitting at this table enjoying such a pretty setting - and the scones look delish! What a cute little hummingbird, and I agree, what a strange place to nest! Such a beautiful tablescape! And blueberry lavender scones! You know what else is nice with lavender in it? Shortbread. Like always, so pretty! The baby birds are sweet. Love, love, love this setting with all the purple, Linda! Very pretty! Lavender is my favorite color! It is nice to see that you are enjoying some of the fresh lavender as well. Very pretty! 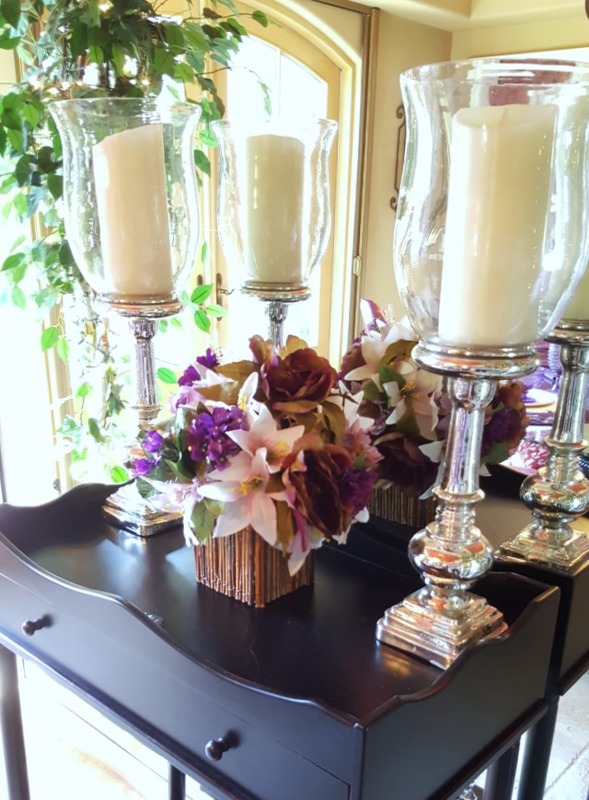 Your lavendar table is breath taking Linda! Your scones look very tempting too and that baby bird, incredible! Beautiful table, Linda! Love the dishes!!! Love seeing the baby hummingbird!!! Have a beautiful week! Ooh I love those dishes and all the lavender! I really love the smell of lavender so I would enjoy this a lot! The blueberry lavender scones must have been delicious! That little hummer is too cute! I love your beautiful table Linda! Purple/lavender is my favorite color! Everything is perfect! 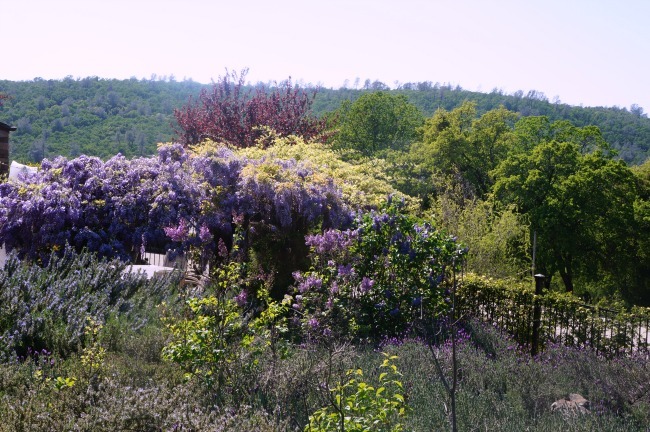 I'm not sure where you live, but I would love to have a lavender landscape. 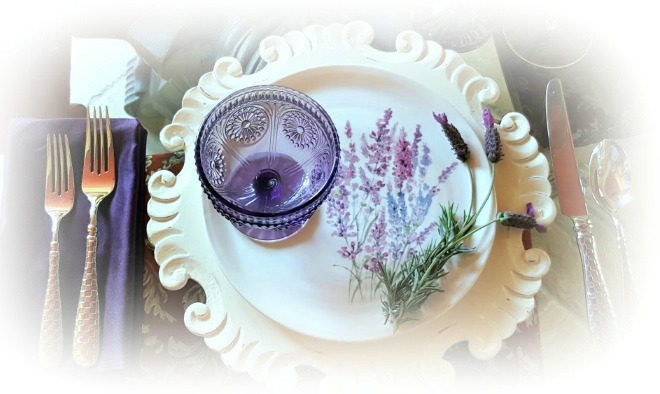 I LOVE your lavender Tablescape! It is wonderful, like the landscap you live! Thank you for all the lovely pictures! The baby bird is too cute and such a perfect nest!! 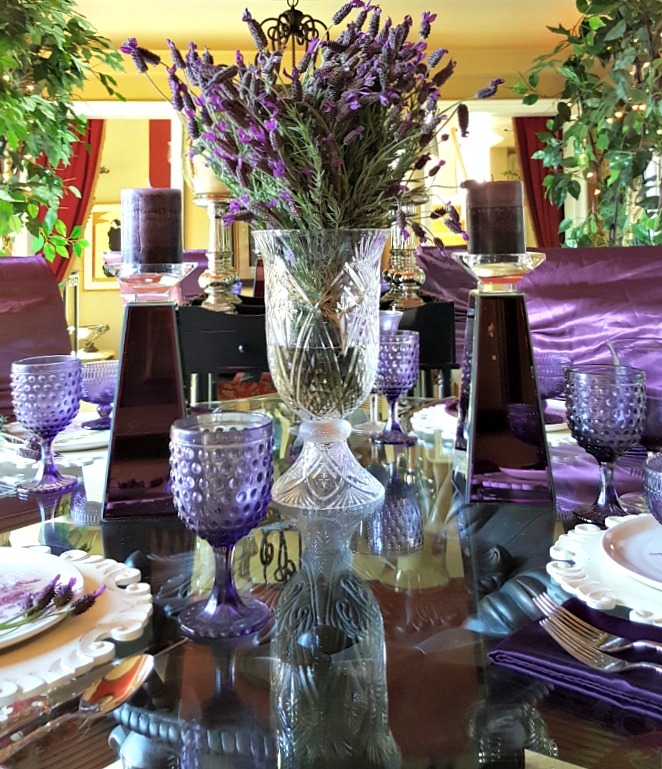 What a lovely lavender tablescape, Linda. I'll bet your home smells heavenly with the vase filled with lavender! I loved seeing the hummingbird that you shared...so sweet! You table setting is gorgeous as always Linda. I've never seen so many different plates-these are beautiful. I love the baby Hummingbird! So precious. We used to have birds next in wreaths on our front door-I'd have to block on the walkway so people wouldn't disturb the babies. Birds pick the weirdest places to nest. I can smell it from here Linda! It is gorgeous. What a pretty, pretty table, Linda. I have a lavender guest room. I find it restful and beautiful. I need to plant a new lavender and rosemary plant this year. I left mine out too long and they got hit by a hard frost and it killed them. Darn it!! Your table is beautiful! Your land, well I would grow me some grapes! Just sayin! Beautiful table, Linda. I love lavender! I have a small mound growing but doesn't get many blooms. I keep dried lavender around in the house. It is so soothing to my senses. Linda, your table is positively stunning. Lavender is one of my favorite plants. Hope you have a great weekend. I never seen real lavender flower and this creation of yours is so pretty. The scone is calling my name.. 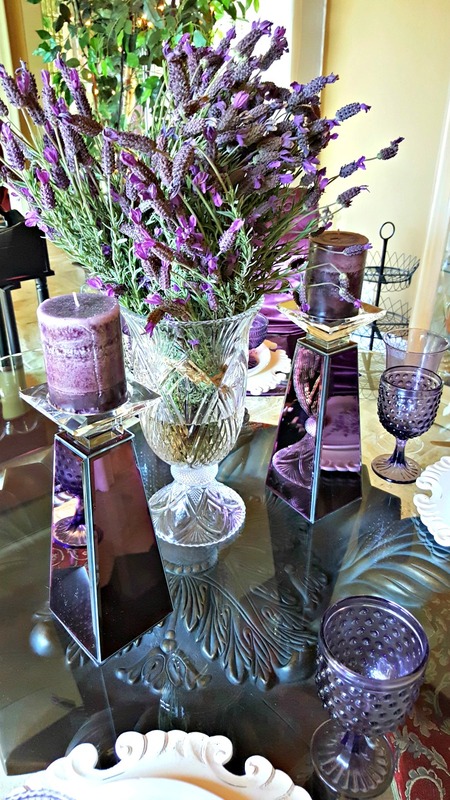 Such a beautiful table with your lavender. I love your collection of lavender colored candlesticks and glasses. It can fit in with so many styles. I love to use lavender in my lemonade. I am hoping to grow more. What a gorgeous post! My favorite colors. Your design elements are amazing. Love your photo's too! You captured some good shots.